PDF3D have released their latest update, Version 2.16: we look at some of the key new features including support for the latest DWG format, 3D image textures, panoramic 360 images, enhanced CAE analysis and support for 3D WebGL. As with every new update, ReportGen and the SDK have received many incremental bug fixes and updates, but this time we’ve also included some powerful new features for large mesh texture-image handling menus, panoramic scene control menus, CAD format conversion improvements, engineering analysis result workflows, and WebGL export. 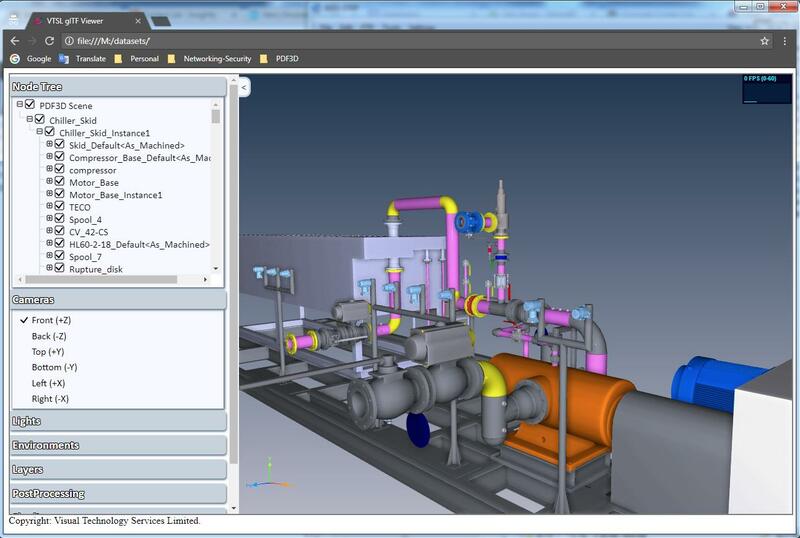 Version 2.16 includes updated features that will prove to be as popular with the manufacturing community as they will with design professionals. V2.16 now supports the latest AutoCAD 2018 DWG format. As part of that, our products come with architectural entities (walls, doors, windows and stairways) and improved DWG transparency. With a new DWG default view scheme covering standard conventions, and the addition of layer semantics and an enhanced translation scheme into PDF Model Tree, v2.16 provides a strong workflow platform for engineering applications and DWG conversion. From Forensics to Archeology, capturing environments with full 3D color is enabled by a vast range of new sensors, cameras and processing algorithms. V2.16 has been developed to encode 3D images from drones, laser scanners, satellite camera images, and more, to deliver complex scenes and realistic new product designs at a higher quality than ever before for enhanced reporting. Key features include texture optimizations, image subsampling on-the-fly, image tiling and mesh optimal joint-splitting, graphics pipeline optimizations and the power to support even larger geospatial images. V2.16 has been enhanced to cater for 3D images from a wide source of devices, including the direct capture of 360-degree panoramic images from smart phones, hand-held devices and professional digital photography gear. As a result, ReportGen and the SDK have had major development to support direct “photo to PDF”, with full spherical in-document navigation. Panoramic 360 VR images can now easily be embedded into PDF with our new menus for scenes, camera and view parameters. The suite also includes automatic scene rotation, zoom and tilt limit stops, and support for direct panoramic JPEG to PDF creation, without geometry. In V2.16, we’ve taken the traditional presentation of CAE analysis, typically shown with colour variances, and added textures on 3D meshes to lift the visual quality and improve the clarity of surface variance. V2.16 enables lighting, shading and surface material adjustments with ease, and includes typical VRML, X3D, PLY, IV vertex color texture synthesis. As an example, one of the many key features automatically synthesizes a polychromatic texture from incoming vertex color. We’ve also included a broader range of CAE mesh results with a wider color palette for further image improvements. To complement and extend 3D PDF document generation with cross-domain export, a new Web browser friendly export for 3D WebGL called “glTF” (GL Transmission Format), defined and published by the Khronos Group, is now available from exactly the same conversion source data. To see these capabilities in action take a look at some of our latest examples and case studies. You can watch a video overview of v2.16 here. PDF3D Version 2.16 is now available across the suite and can be downloaded by quick request.